The term Big Data has taken different flavors and forms in the last decade. 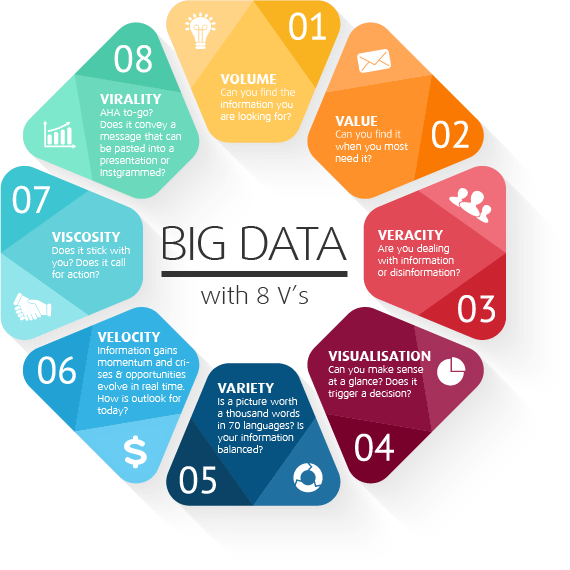 Big data is a field that treats of ways to analyze, systematically extract information from, or otherwise deal with data sets that are too large or complex to be dealt with by traditional data-processing application software. In this presentation, i’ll create the big data companies list where companies are launching their programs to use the massive data available and gain insights from it is extending every day. I’ll try to look at the top 10 big data companies list in the global IT market. it will help you leverage the information on prospective big data companies in the market while making a decision regarding which company to target. Splunk Enterprise started as a tool for log analysis and it expanded on machine analytics. The data analytics services provided by Splunk help in making information usable. Splunk offers the tools that help in monitoring end to end online transactions and real-time service usage. The big data solutions offered by Splunk are Splunk ODBC Driver, Splunk DB Connect and Splunk Analytics for Hadoop. It is also famous for its sentiment analysis that can be used on social media platforms. Founded in 1998, VMware has its headquarter in California. It is a well-established firm in the virtualization and cloud service field, and it is growing itself in the big data arena now. The virtualization services for big data allow cost-effective and quicker results. The big data products offered by VMware are flexible, simple, secure and agile with cost-effective solutions. Furthermore, the virtualization helps in more straightforward big data infrastructure management. The product vSphere big data extension enables the management, control, deployment of the Hadoop deployments supporting Apache, MapR, and Hortonworks. HPE has the main product “Vertica Analytics Platform” that provides fast performance in SQL Analytics and Hadoop while working on huge structured datasets. Another big data solution of HP is IDOL that gives a shared environment for all kinds of data with visualization, intelligence, and exploration. SAP is known to be the biggest company in business software established in Germany in 1972. It is the biggest provider of the enterprise software application and is one of the largest cloud companies. The products and big data solutions offered by SAP include SAP IQ which is used for transforming businesses and decision making and SAP BusinessObjects BI that analyzes huge datasets with high performance. Besides that SAP predictive analytics uses machine learning and predictive algorithms for creating, deploying and maintaining predictive models. Oracle is the well-known firm in the database field and has grown to be the most significant player in the big data field as well. Oracle boasts of integrated platform services and cloud applications with a vast customer base and a large number of employees. The products offered by Teradata are Kylo, Data Mart Appliance, Integrated Data Warehouse and Aster Big Analytics Appliance. Kylo is the open source software that reuses templates whereas Data Mart Appliance uses the analytical power from the Teradata database. Integrated Data Warehouse by Teradata is seen as the most powerful database in the world that gives 360 degrees business view. Along with that, Teradata also has applications like Teradata Unity, Teradata Viewpoint, Teradata QueryGrid and Teradata Listener. As an American company, International Business Machines (IBM) has its headquarter in New York. It is one of the most prominent Big data vendors in the world as per the revenues generated from Big data related services and products. Also, it is one of the top-rated Big data companies in India. IBM offers the storage and server hardware, analytics applications, database software and related services. Founded in 1998 the company has its headquarter in California. Google boasts of end to end and integrated big data solutions provided by it. Known for its innovation, Google has been expanding in the field of big data analytics and believes that the organizations can capture, store, process and analyze with its single platform. Microsoft is the top software programming and product firm with its headquarters in Washington, USA and it was founded in 1975. The firm has expanded its big data strategy hugely with the partnership with Hortonworks, and it is rapidly growing in analytics field now. It has the 3 big data solutions: HDInsight, Microsoft Analytics Platform System and HDP for Windows. Amazon offers a popular cloud-based platform. The big data product offered by Amazon is Elastic MapReduce based on Hadoop. Many big data analytics solutions are easily deployable using Amazon Web Services. Moreover, AWS allows fast access to IT resources. Besides, that analytics frameworks offered by Amazon are Amazon Elasticsearch Service, Amazon EMR, and Amazon Athena.